So I have been “researching” this blog post for awhile, and I think I have a good list to get started. By research, I mean going through my girls’ old and new toys and remembering what some of their favorite gifts were at each age. As I sat on my computer on Amazon last night ordering birthday gifts for the next three weekends of birthday parties, I realize I need to research the next set of this list – birthday gifts for school-age children! In time…but for now I don’t want to forget what were good gifts when my girls were little, and as more of my friends begin to have children I will need to look back at this list for my own recollection! My First Words book – both my girls LOVED and still LOVE this book. My youngest will sit for at least 15 minutes and just stare at the pictures. There are many books like this, so no need to get this exact one, but the pictures and categories, plus tabs in the book are great! Ball Popper – lots of fun, who wouldn’t love this! This will keep them occupied well into two years of age. Again, there are many versions of this, so choose the one you fancy. Water Table/Sand Table – there are tons of these on the market, it is hard to choose which one is the best, so find the one that your family would appreciate based on what works for your space. We got one that had two sides, one for sand and one for water, and it worked well because it didn’t take a lot of space in our backyard. Birthday Cake electronic toy by Leapfrog – not sure the fascination with this toy, but it never fails to capture their attention, again for more than just the first year. B. Squeeze blocks or B.Hi-phone. – first off, I just LOVE this toy company. Pretty much anything in their line is awesome, and we have been given many of their toys. You will see them in my list for other ages too. They are a good start if you are unsure of what to get a child. Farm Match Up – this toy is so versatile for the early learners. It has the matching componentfor creating the animals, it makes the animal noises, and comes in a bucket – toddlers love spilling things out of buckets! The older version was a magnetic one but I had a hard time finding it still being sold. Tractor Toy – one year olds seem to love animals, and this, like the magnets, makes the sounds of the animals and has the added element of wheels! It goes on its own when you push the front horn…great incentive for crawlers. So I might even suggest this for the under 1 crowd. Poke-a-Dot Books/ “Pop” Books. These kept my girls busy on a long road trip in the past and still do during the day at home too! My four-year-old still enjoys popping the plastic bubbles! There are a few versions – Old MacDonald, Ten Little Monkeys, and more! Musical Instruments – this is the age when they really begin to love hitting, shaking, and making noises! Drums, shakers, bells, cymbals, are all great first instruments! Of course, as they grow, guitars, recorders and even a microphone can be fun! Dress -Up Items – during the third year of life children begin to explore roles, their place in the world, and they do so through imaginative play. It is so sweet to see this stage begin, and it will last for many years. For my daughter’s second birthday I got a paper suitcase and went to JoAnne’s where they had a variety of inexpensive dress-up vests (doctor, nurse, police, construction worker, magician) and a few hats, and put them in the suitcase. She LOVED them, and still does! They make great pretend play props. There are many places to find dress-up items and accessories, even start in your own closet! Pretend Play Items – In addition to dressing up, toddlers enjoy mimicking what the adults around them do. A play kitchen is a favorite of this age. Pretend food, and other kitchen accessories are fun. A baby doll is great at this age. Other items like shopping carts, cash registers, doctors sets, etc, are all great pretend play items. You can also find things in your home that you don’t need that your children will love to play with. I often kept old cereal boxes, or food containers after the were washed, and they were great fun in the play kitchen. Bristle blocks – these are the comb-like blocks that stick together and come in fun shapes and colors. Many companies make them, and call them a variety of other names, but they are all essentially the same. As toddlers begin to enjoy creating structures and stacking, these are great because they stay connected more easily. This is also a great gift because it can be enjoyed for many years to come. My four-year-old is not creating vehicles and other creative items with them, whereas when she was younger she liked to simply stack them. Peg Board – Anyone else remember playing with one of these in kindergarten? I loved them then. We got one for our older daughter for the holidays when she was two and she still really enjoys it. My youngest has also now begun to play with it; she will stack many pegs on top of each other or just fill the board. It is great for fine motor skill development, as well as imaginative play. Magnadoodle – many companies make one now and they have been the best backseat activities for long drives – especially since the pen is attached to the board, so it can’t roll on to the floor. Even before age 2 this is a nice toy, but they really enjoy putting pen to paper at this age, and this is a nice, and cleaner substitute. As they grow older they will appreciate the stamps that many come with, and make more actual pictures, but they are great to scribble on! Musical Instruments – had to include this again, as it is always a fun idea! Outdoor toys with wheels – bikes, Cozy Coupe, Strider bikes, are all great at this age and beyond. Jigsaw Puzzles – it was at this age that my older daughter really began to enjoy doing puzzles. It started with 24 piece puzzles and has now advanced. The shape puzzles where you have pictures that you put in specific cut-out spots are great for younger tots, but jigsaw puzzles (especially with favorite characters) are now a fun activity. My daughter will do the same ones over and over too! Memory Game – this is a fun activity for both you and your child to do together. There are many versions of this game out there. Preschoolers are now at the age where they can use some of the spatial recognition and memory to locate pictures. My favorite was a gift we made for Daddy’s birthday – a personalized memory game with pictures of our family. We made it at: Printers Studio, and it was reasonably priced too. They love seeing pictures of themselves in the game! Uno Moo – at age three they are beginning to be able to play games. This is a great first game, and one that will be good for preschoolers age 3-6. There are many other great games out there for this age group, these are just two of our favorites. Magna tiles – these are a favorite of both my girls at preschool. And so much so that I didn’t want to spoil that fun by making them available at home too, so I held off putting it on their wish list. They are fabulous though! This is an item that has enjoyment for many ages, even beyond preschool years, so it is a gift that will last for awhile. They aren’t cheap, but are lots of fun for the little ones who love to build. Legos – smaller legos or duplos begin to be fun at this age, as the preschooler can manipulate them into structures and buildings, verses just stacking them. There are tons of sets out there with all kinds of characters to attract kids, but plain old colors are just as great too! Art supplies – art supplies are great for two year olds too, but I have found that by age three they are a little less apt to paint the walls or table and stick to the paper or project. At three they can also do a lot more by themselves and stay attentive to their project for a longer period of time. Just be sure whatever you get is WASHABLE! Battat Take-A-Part Toys – there are a few of these, not just the airplane as I put in the link. This toy has its own power tool, which is always fun! An electric screw driver to screw in the pieces and create or take apart the vehicle. Quercetti Color Peg Board – think of it as an introduction to light bright! Colored pegs you push into a board with a picture behind it to match the colors. It says age 2+ on it, but I’d be worried about the small, round pegs ending up in a a two-year olds mouth, so I put it in three years. It was a hand-me-down from a friend, and my older daughter still loves playing with it! Fiddle Sticks – there were called tinker toys when I was young, but it is the same. Wooden rods, pegs, shapes, that stick together to create an array of creative structures. I debated about where this was good for three or four year old birthdays, but I have found the older set to be more adept at using these and putting more pieces together. Imaginets – these are like magnetic tanagram pieces. They are colored shapes that stick magnetically on a board with pictures of diagrams to try to copy. It says 3+ on the box, but my four-year-old is just now able to really begin to copy them. They are fun to create designs with regardless. Stomp Rocket Jr. – this is one that is fun for the whole family! I think even younger than age four, but I’ll leave it in this list for maturity sake, and get extra rockets, as they do fly far and often land over fences or on rooftops! Color Forms – Anyone else play with these as a kid? Now you can get the simple shapes, or even more fun, characters and play sets of your child’s favorite person. My daughter loves the Daniel Tiger one, and acts out scenes with the “stickers” quietly on her own. They are great to bring to a restaurant! Board Games – this is the age where children really begin to enjoy board games and being a part of a team. My daughter has a variety of different games she enjoys playing, even by herself to just set up the pieces. Daniel Tiger has a great one for learning social skills, and there are many others out there for early phonics and letter or number exposure. I know the are iPad apps for all that too, but there is something fun about an actual game piece in your hand at this age. Marble Run – this activity is one that can require some adult guidance, but they will get the hang of it quickly. It is also a toy that can last for a few years of fun, for as they get older and understand the physics behind it all, they get better at creating different runs. And of course, BOOKS!! They are great at ANY age! See my children’s bookshelf for some of our family favorites! So there you have it! A beginning of a list of some great items my family has loved! I know there are many more, and as I clean up the house and play room I’m sure I’ll find many more I could have added, but I hope this gets you started; and will be a nice reminder for me when I have to get another birthday present for a little one. Now I need the list for ages 5 and up! I haven’t gotten to there with my children yet, so I can’t speak from experience like I could with these items…what were some of your child’s favorite gifts at younger ages? Here is my oldest opening a game on her third birthday! 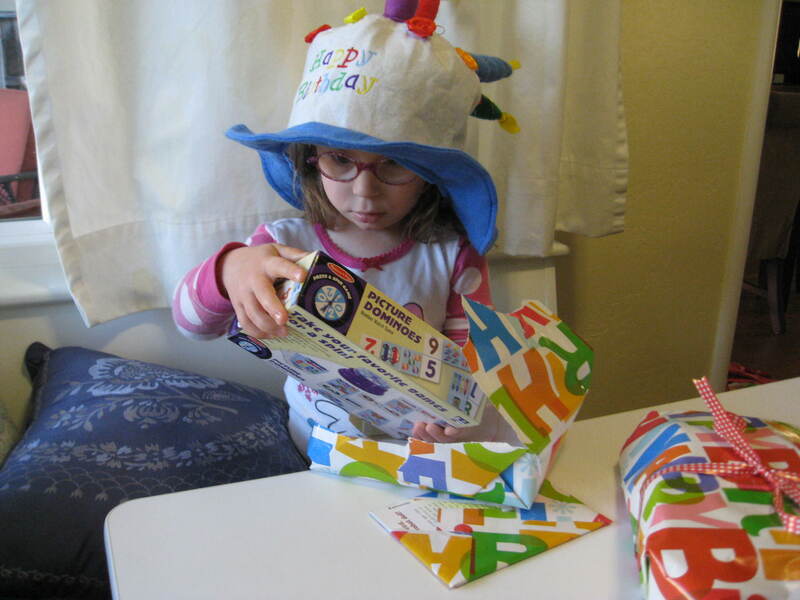 This entry was posted in Birthdays, Helpful Products, playroom, preschoolers, Toddlers, Uncategorized and tagged birthday gift for babies, birthday gifts for preschoolers, birthday gifts for toddlers. Bookmark the permalink. As the future grandmother to a granddaughter I have found your gift suggestions to be very helpful! I will meet my granddaughter in about six weeks! Chris, I’m so glad that this is helpful for you! Congrats on becoming a grandmother, and to your daughter too! Such an exciting time! !